The recent uptick in mortgage rates shouldn't derail profits at JPMorgan Chase, Wells Fargo and BofA due to their stranglehold on the market. 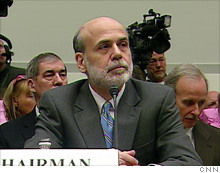 Ben Bernanke has been trying to bolster the economy by keeping rates low - a big help to the banks. NEW YORK (Fortune) -- The refinancing tide has ebbed, but mortgage profits for the nation's biggest banks are in no danger of drying up. The recent uptick in bond yields has muffled this spring's home-mortgage refinancing boom. The Mortgage Bankers Association said Wednesday that its refinancing index dropped 24% last week to its lows level since February. It stands to reason that a slowdown in mortgage activity could hurt Wells Fargo (WFC, Fortune 500), Bank of America (BAC, Fortune 500) and JPMorgan Chase (JPM, Fortune 500), the three biggest private-sector mortgage players and big beneficiaries of the earlier refinancing spike. But fret not for the big three mortgage banks. Thanks to the scale of the recent refinancing boom and the banking industry shakeout of the past 18 months, the mortgage profits should keep coming for them this year -- helping these institutions to weather deepening loan losses and tricky markets. What's more, while mortgage rates have risen from last month's lows, government programs aimed at reducing rates may reassert themselves over the course of the year. Some observers contend that future declines may well be met with a new rush of lucrative mortgage refinancing. "Recent performance of [refinancing activity indexes] showed surprising declines in the face of modest increases in mortgage rates," Bank of America-Merrill Lynch credit strategist Jeffrey Rosenberg wrote in a note to clients last week. "Such declines may reflect an expectation of [lower] mortgage rates in the future." Refinancing activity has dropped sharply since April, when rates for a 30-year fixed mortgage stabilized below 5% for the first time. The MBA's refinancing index has plunged 57% since hitting its recent peak in the first week of April. But while 30-year conforming mortgage rates have recently risen to about 5.4% amid a sharp rise in Treasury rates driven in part by worries about the U.S. fiscal outlook, officials haven't given up on trying to bring rates down. Federal Reserve chairman Ben Bernanke told the House Budget Committee Wednesday that "we're pretty comfortable" with programs launched in January that call for the Fed to buy hundreds of billions of dollars of mortgage-backed securities, or MBS, in a bid to bring down interest rates and bolster financial markets. The Fed has bought some $500 billion worth of agency-backed MBS -- those guaranteed by government-sponsored entities such as Fannie Mae and Freddie Mac -- and has plans to buy as much as $1.25 trillion of the securities this year. Despite the recent uptick in rates and questions about the program's effectiveness, Rosenberg said the effort will be a key driver of interest rate trends. "Expanding Fed purchases of mortgages remains a key tool to bring mortgage rates back down," he wrote. "Given how quickly rates have increased, for many the mortgage refinancing decision is no longer economically rational, increasing the motivation of the Fed to accelerate its pace of intervention in mortgage markets." Even if rates don't immediately drop, JPMorgan Chase, Wells and BofA should post solid mortgage numbers for the rest of the year. That's because after buying out a raft of distressed rivals, the big three now account for the lion's share of U.S. mortgage originations. They also service about half of U.S. home loans, mailing out and collecting mortgage payments even for loans they did not originate. That means the profit margin on each transaction is bigger than it was during the housing boom, when the home loan business was rife with competition. So unless rates unexpectedly spike, the mortgage business should be a money maker in coming quarters. Bank of America, whose mortgage origination nearly doubled in the first quarter from the fourth quarter of 2008, said in April it expects the strength in mortgage lending to persist for the rest of the year. JPMorgan Chase, the No. 3 mortgage player after leading servicer Wells and top lender BofA, likewise appears poised for solid gains, though the bank has warned that it won't repeat a $1 billion first-quarter gain tied to the value of its mortgage servicing rights. Wells, the biggest beneficiary with a fourfold rise in first-quarter mortgage-banking revenue from a year ago, has been most confident about how it will do in the quarter ending this month. Wells Fargo chief financial officer Howard Atkins said at a banking conference in London last month that "the second quarter promises to be strong as well," citing the company's pipeline of $100 billion in unclosed loans at the end of March.